Every year the University of Seoul (UOS) receives a large number of foreign students through various scholarship programs; such as the Korean Government Scholarship Program (KGSP), the Metropolitan Scholarship (MUAP) International Summer School, and some other sponsorship programs for foreigner. During their time here, they interact and learn with students from other countries, but they rarely get the opportunity to be in the same class with Korean students. When they first move to Korea, just as any other person would feel in a foreign environment, they need friendship and guidance. UOS recognizes how the first few weeks can be the most difficult, and so there are structures in place to foster relationships between Korean students and the newly arrived foreign ones. These structures consist of UOS Buddy, Seoul Friend and Seoul Mate. 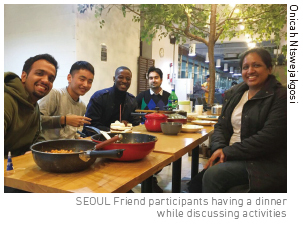 In the last edition, The UOS times covered Seoul Mate, but in this issue The UOS Times interviewed two students; Kinley Tenzin (Bachelor of Dept. of Life Science), who is from Bhutan and one of the participants of UOS Buddy and Yordanos Hailu Worku (Masters of Dept. of Urban Planning), a Ethiopian participants of Seoul Friend, in order to know more about these platforms. 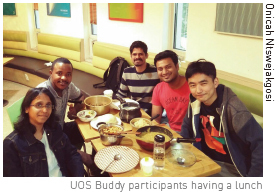 How did you find out about UOS Buddy program? The information was pinned on my Edu Class. At first, I did not take any interest but after much persuasion from the coordinator of my scholarship program and also the head of UOS Buddy program, I eventually decided to give it a try. There were other new students coming through my scholarship and I had the experience to share with them, so joining UOS Buddy was not such a bad idea after all. The second time I voluntarily joined, although for another reason. I wanted the certificate, so it was incentive enough. What are some of the activities you did? I helped the new students with registration, helped them settle in, and get accustomed to their new beginnings. I showed them areas surrounding the school where they could do their shopping; like the Cheongnyangni Market and Daiso, which is one of the biggest wholesale companies for goods in Korea, and I helped them at the bookstore. I had used textbooks that I was not using then, so I gave them away to my new buddies. I also helped them connect to the school internet and introduced some of my friends to them. On numerous occasions, I prepared tea from my country and we would sit down as we drank it and got to know each other more. I still vividly remember the day I cooked them food from my country. It was so spicy and when they tasted it they cried. We laughed so hard, and I apologized because for me it tasted normal because people from my country love spicy food. Another thing I remember was when I told them I was from “Bhutan,” but because my country is not very popular they thought I had said Bukhan, which means North Korea. I also remember the day I wore a Ghanaian outfit and Ecuadorian dress. I was interested that my buddies also tried on clothes from Bhutan. These were very exciting and interesting times. Did you find Seoul Friend helpful? Sure, it was. Seoul Friend made everything so easy for us. When I first came, I could not utter a single word in Korean, so they came in handy, especially when we needed to use transportation and when we needed to go shopping. When we first arrived, they took us to Insa-dong, which was to be our temporary guest house, and they showed us around and took us out for meals. They gave us our first orientation that we could never get from professors. What were some of the activities you did together? They organized several gatherings where we all got to know each other personally. They stayed with us every day and took us to different places; such as the palaces, museums, towers and many more. Definitely the hospitality we received. It was so rare and I do not think I will ever forget the respect Seoul Friend gave us. They always exceeded expectations; sometimes they even missed their buses and trains because of us. They were so kind and I genuinely do not think I will find this anywhere else. Not to mention that even though they are busy students, they still sacrificed so much of their time for our convenience. Did they influence how you view Korea? Absolutely! From then on, the perception I have had of Koreans has been a positive one. Korean people truly have a warm spirit. Even beyond Seoul Friend program, some of them have become very close friends of mine. In conclusion, we can see how useful these two platforms are in helping new students settle in and how they go a long way in fostering good relations between Koreans and the international community. The UOS Times recommends all of them to join in these programs.